Recently, the above numerical model has been improved by considering the thermal flux saturation effect. Thus the CS evolution can be traced for a longer time. The improved model shows that the CS evolution during solar eruption can be divided into four stages. The first stage shows the CS forming and gradually lengthening. In the first stage, the temperature of the CS is lower than the ambient coronal plasma while the density is higher. Resistive instabilities that disrupt the CS mark the beginning of the second stage, and the CS is heated by reconnection and the density of the CS decreases because the magnetic islands carry away some mass form the CS. Magnetic islands disappear in the third stage and reappear in the fourth stage. 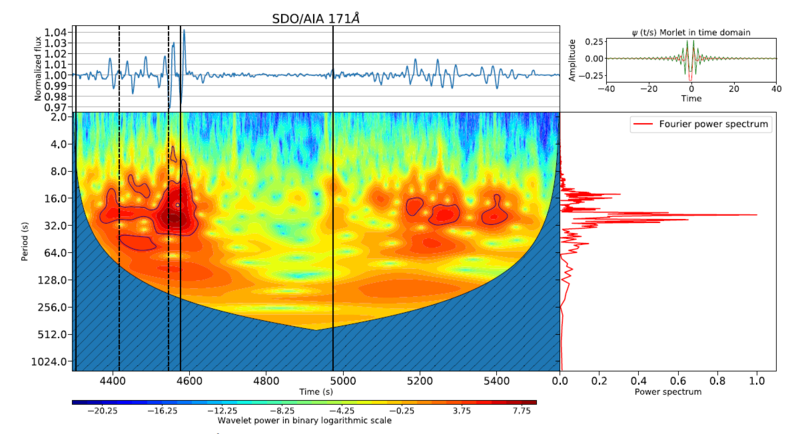 Based on the MHD simulation data, synthetic images and light curves of the seven SDO/AIA channels, i.e., 94 ？, 131 ？, 171 ？, 193 ？, 211 ？, 304 ？, and 335 ？, and the 3–25 keV thermal X-ray are obtained with forward-modeling analysis. The snapshots in Figure 1 shows the temperature (upper right panel), density (bottom right panel), pseudo thermal X-ray radiation intensity (upper left panel), and pseudo SDO/AIA radiation intensities (other panels) in the x-y plane. Figure: Wavelet transform of the 171 ？ light curve normalized by robust locally weighted regression. Vertical lines have the same meaning as in Figures 4, 9,and 10.